Dr. Sklenar's Kombucha Teas provide a natural way to assist in digestion by detoxifying and re-energizing the body. Kombucha Tea is rich in antioxidants and probiotics, which helps to detoxify and cleanse your body, promoting general health and well-being. Dr. Sklenar's Kombucha Green Tea harnesses the antioxidants found in green tea along with the revitalizing properties and great taste of Kombucha tea in one refreshing beverage. Available for the first time in the United States, Pronatura now brings the original Dr. Sklenar Genuine Recipe Kombucha Tea, Kombucha Green Tea, Kombucha Press Extract & Kombucha Tea Capsules. Dr. Sklenar's formulas have been extensively researched and have been sold in Europe for over 40 years. Drinking Pronatura's Original Kombucha Tea every day can help promote and boost your natural health defenses. Kombucha Tea is rich in antioxidants and probiotics, which helps to detoxify and cleanse your body, promoting general health and well-being. Available for the first time in the United States, Dr. Sklenar's Kombucha with Green Tea! Contains essential vitamins for energy, minerals for structural strength and enzymes for digestion, and amino acids for tissue. This lightly fermented, tea-based beverage was considered a perfect food and healing source for the people of ancient Asia. Kombucha Press Extract is rich in antioxidants and probiotics, which helps to detoxify and cleanse your body. When used as dietary supplement, this extract has all the benefits of Kombucha Tea in a concentrated liquid extract. 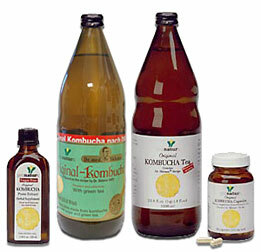 Kombucha Tea Capsules are rich in antioxidants and probiotics, which helps to detoxify and cleanse your body. Used as dietary supplement, these capsules have all the benefits of Kombucha Tea contained in an easy to swallow capsule.